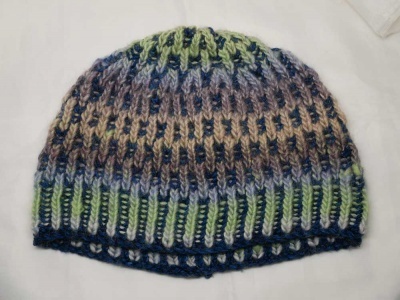 A fun and oh-so-squishy-and-warm hat! This unisex honeycomb patterned hat, knit in two-color brioche, reminds me of the intricate carved wooden screens in traditional Middle Eastern art. 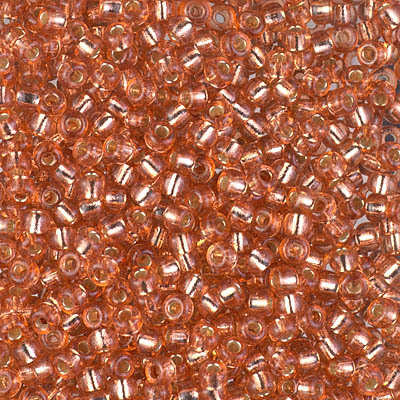 It has a slouchy fit with a series of eye catching decreases at the crown. Mix it up and flip it inside out for a totally different look of lines and dashes. 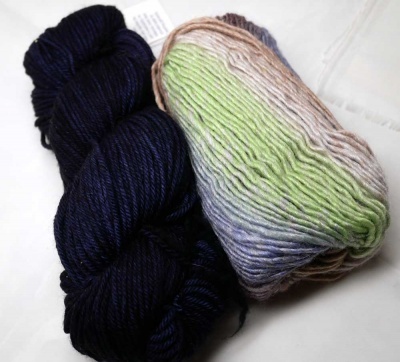 Note that Xandy highly recommends that you try simple 2 color brioche stitch in the round before starting this project. 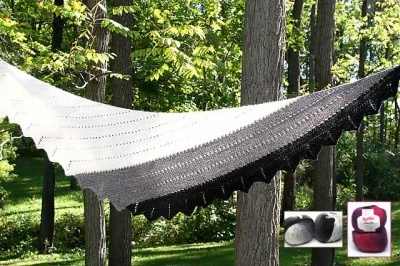 Get your pattern directly from Xandy on her Ravelry page. What we have here are the two yarns that I used for the one I made.The pattern is very clear and includes very useful videos on a few choice points. 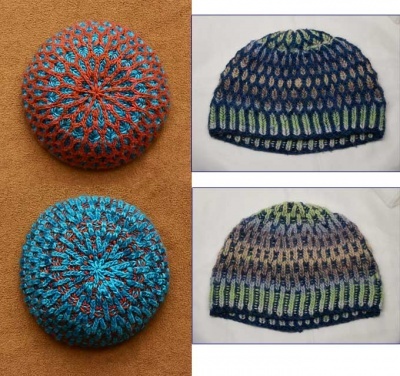 The top photo shows Xandy's original hat (both sides) on the left and the one I knit on the right (also both sides). 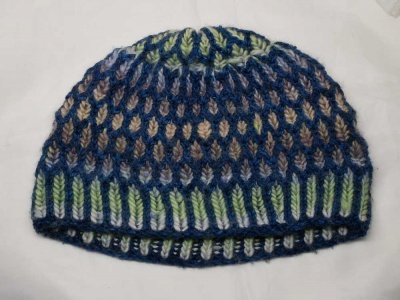 My hat I knit with one skein each of Rios from Malabrigo and Poems Silk from Universal. 1. My solid color yarn is from Malabrigo, their Rios, pure merino superwash, with 210 yards / 100 g. The colorway is Paris Night, a deep and rich blue. 2. For the second colorway, I wanted a yarn where the colors changed graduallyand Poems Silk seemed to fit the bill beautifully. Poems Silk is 109 yards/ 50g of 75% wool/ 25% silk. The yarn is similar to a roving, only very loosely plied. The colorway was designed by Cornelia Tuttle Hamilton and is called Landview. It includes ecru, beige, lime, lilac and aubergine, all with long color runs. 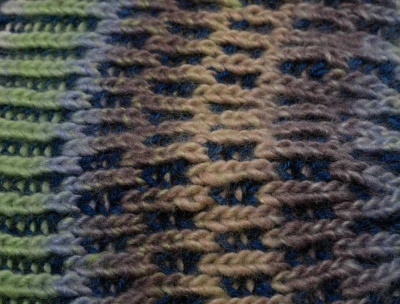 I love how it stands out against my solid color yarn, with no blending but still looking very good with it. The hat is marvelous. Double-layered and squishy, it will be a wonderful winter warmer. It feels awesome and looks great on either side.